Preheat oven at 200 degrees celsius. Dice the nectarines, seed the pomegranate and pick the thyme, then mix them together with a touch of cherry vinegar. 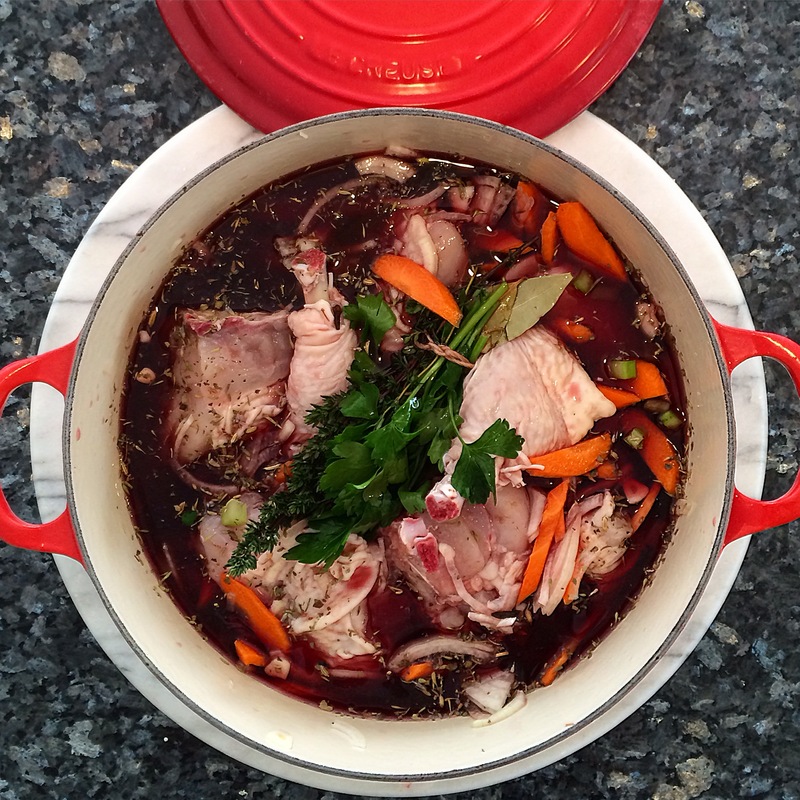 Coq au Vin is considered one of the all-time classic French recipes. Presumably, the original recipe called for Rooster, as the translation of the dish’s name is “Rooster in wine” but today it’s very much considered a chicken dish. This one-pot wonder is a delightful concoction of browned chicken, red wine sauce with salty pork lardons and mushrooms. The best thing about this dish is that it tastes even better the day after you’ve cooked it because all the ingredients steep together overnight, making it a perfect dish to prepare in advance for guests or a busy week ahead. More traditional recipes call for Burgundy wine, but I chose to make this recipe with Shiraz as I feel it gives the sauce more depth of flavour. There are some regions in France that use white wine for Coq au Vin, so really, you can feel free to experiment with your favourite grape variety. Put the chicken pieces into a deep cooking pot. I like to use my Le Creuset Round French Oven for slow cooking. Add the celery, bouquet garni, brown onion, carrots, garlic, cloves, peppercorns, cognac and red wine. Leave to marinate for 5-6 hours or overnight in a cool spot in the kitchen. Take the chicken out of the marinade, discard the vegetables and pour the remaining wine into a jug. Place the cooking pot on high heat and add the olive oil and butter (or duck fat). Place the chicken into the pot and seal on all side until golden brown. Remove from the pot and keep aside. Add the onion and lardons to the pot and cook until slightly brown. Sprinkle the flour over the top of the onion and lardons and slowly add the wine while whisking. Whisk well to make sure everything is mixed through. Add the chicken, season with salt and pepper and cook for 1 ½ -2 hours on a low heat with the lid on but slightly open to let the steam out. Heat up a non-stick frying pan without anything in it. Add the mushroom and cook until they stop releasing water. Add them the pot ½ hour before the end of cooking. Preheat the oven at 180 degrees Celsius. Place the vegetables on a roasting tray, drizzle with olive oil, sprinkle with Herb de Provence and season with salt and pepper. Cook for 45 minutes or until tender. I suggest you serve the coq au Vin with a fresh crusty baguette and a glass of EVOI Cabernet Sauvignon available from Airoldi Fine Wines. Watch the how to video below or visit my Youtube channel here for more. Melbourne Food Blog. Food is essential!